Hey! New restaurant opened in Kalamazoo. Now, we weren’t there waiting for it to open, but last week, J and I both noticed (on separate trips) that the old Red Crown Pharmacy had been converted to a Moe’s Southwest Grill and it was opening soon. Soon was this past Thursday. When J got off work, she asked if L and I wanted to meet here there for lunch. I didn’t have any other plans and I’m always up for tacos. Moe’s Southwest Grill’s first Kalamazoo area location is on Stadium Drive right next to Gallagher’s Eatery & Pub where, as I mentioned earlier, Red Crown Pharmacy used to be. The building has been empty since last February when the pharmacy closed down. 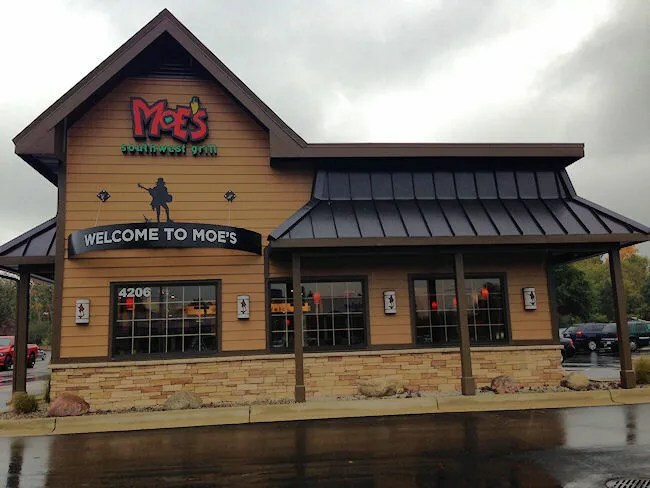 I had been hearing rumors of Moe’s moving in for quite some time, but it wasn’t until we started seeing signs going up that we even realized construction had been started. 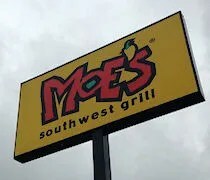 Moe’s Southwest Grill is an Atlanta based Tex-Mex chain with over 500 stores nationwide although this is the first of two in the Kalamazoo area. The building that houses Moe’s has undergone extensive renovations to become the Tex-Mex restaurant. The ordering process is pretty similar to Qdoba or Subway. They have the typical American Mexican restaurant favorites. Burritos, tacos, quesadillas and nachos among other things. Each option has a protein or vegetarian option and the protein option actually has five options…they call it protein instead of meat because tofu is one of the options. J, L, and I got there about a half hour after they opened and there was already a full parking lot. I had looked at the menu ahead of time, but J needed a minute. We started by ordering the Mini Masterpiece for L. The kids meal comes with a cheese quesadilla, cookie, kid-sized drink and chips and salsa…although we didn’t get the cookie. The Mini Masterpiece is a simple meal and L ate about half of her quesadilla, but when we sat down, she reached right for the chips. I passed on tacos for the time being instead ordering the Billy Barou Nachos….and yes, Billy Barou is a reference to Caddyshack. A lot of their menu items are pop culture references. I ordered the nachos sirloin-grass fed steak, pico de gallo, jalapenos, and queso. They have options of over 20 veggies to add, but I like to keep things simple. 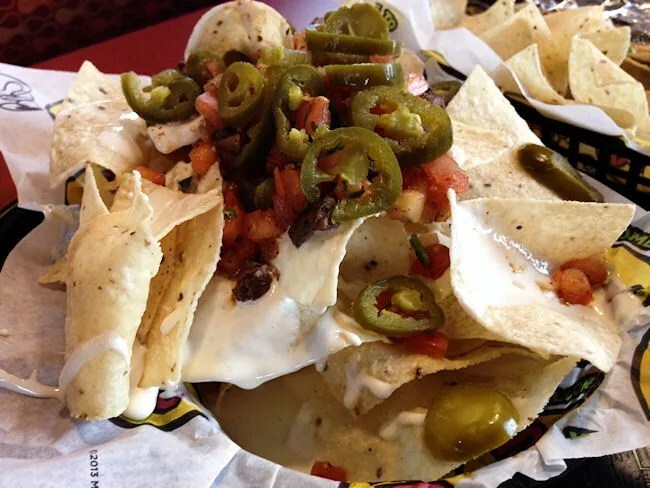 The nachos also typically come with beans, but I’m not a huge bean fan. I would have eaten them had they been put on, but it was offered to leave them off, so I did. The nachos could have used a lot more steak as the topping was about 90% pico. I probably should have went with the pulled pork or ground beef and I’m guessing I would have gotten a little more meat. J’s eye was drawn to the Earmuffs Burrito Bowl. She was going to pass on protein, but changed her mind at the last minute and selected the pulled pork. 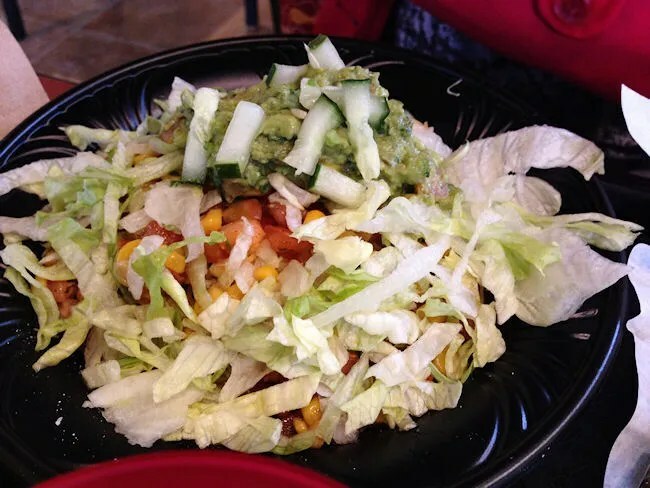 The burrito bowls all include rice, beans, pico and guacamole. J added lettuce on to hers as well. She told me after a couple bites that she liked the burrito bowl concept and Moe’s was just as good as any of the other Tex-Mex places, but this was closer to our house, so it may become a default taco place. The bill was a little over $20 which is pretty average for us at Tex-Mex places. Other than the lack of steak on my nachos, all of our meals were delicious. We added a side of queso for our chips and while it’s not as good as Qdoba’s, it was still pretty tasty. 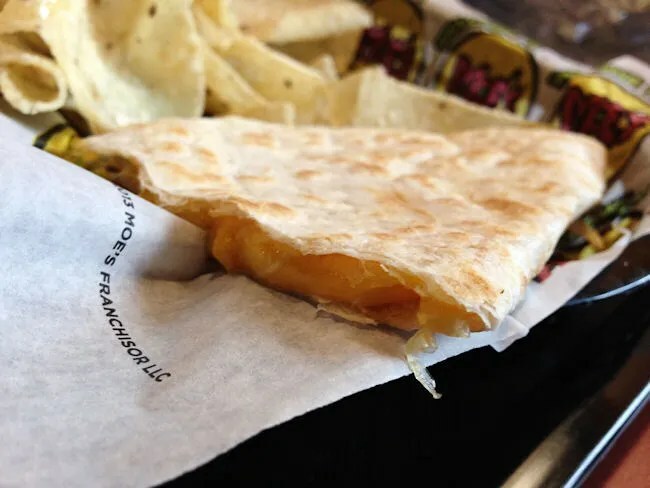 The only complaint about Moe’s was the noise. It was loud. We both felt like we were yelling at the order counter which is kind of annoying, but not something that would keep us away.